Our Rainbow Baby Is on the Way! This year, Mother’s Day has a whole new meaning for me. 3+ years of trying and one miscarriage later, I am SO excited to announce that we’re expecting! Today I am 13 weeks + 1 day AKA one day into my second trimester. I’m due in November! I never knew about the term “Rainbow Baby” until I miscarried my very first pregnancy in November of last year. As I mentioned in my miscarriage story, Joshua and I had been trying to get pregnant for a couple years only to find out I had PCOS. PCOS made it that much harder for me to get pregnant, so you can imagine how devastating it was to finally get pregnant only to have it end in miscarriage. And not just any miscarriage – a missed miscarriage. As in, the fetus stopped growing but my body kept having pregnancy symptoms. It wasn’t until my first ultrasound at 9.5 weeks I learned the fetus was 3 weeks behind and there was no heartbeat. A week later I miscarried naturally. Exactly one month to the day from my miscarriage I started my period again, and two cycles later we were given the green light to try again. I waited one more month for good measure, and when we tried again we got pregnant! Mid-April I had my first ultrasound and you can imagine my relief when this time we saw a heartbeat! Baby was right on track growth-wise and definitely had a heartbeat! It was incredible to see it’s teeny tiny heartbeat flickering away. The doctor said at this point there was a less than 5% of miscarriage. We were both so relieved and overjoyed! Today, April 12, 2017 was a very good day. Fast forward to last week, I had both my first trimester screening and my second appointment with my OBGYN. 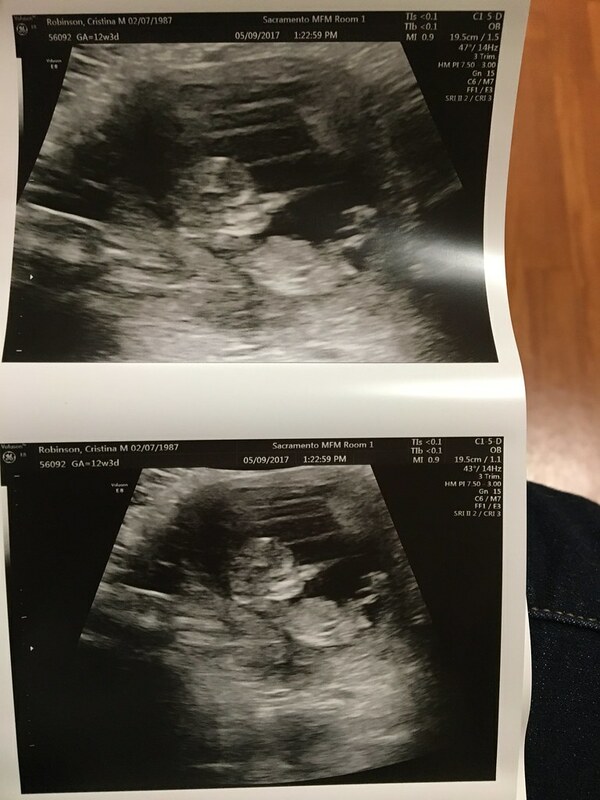 As soon as the ultrasound tech pulled up my baby on screen, it started jumping around and waving. IT WAS SO AWESOME! No joke, my baby was acting like dancing Baby Groot on screen. It was so funny because it wouldn’t stop moving making it a little challenging to get the snaps we needed. Eventually baby calmed down allowing us to get some pictures. Yesterday I started my second trimester. We are on track so far to have a very healthy baby! I originally took a couple tests early – you know, the ones that say up to 5 days before your missed period. All negative. But I was pretty certain I was (it’s just one of those things you know), so I waited until the day after my period was due to start. I was a little impatient, hehe. I also was starting to crave Reese Peanut Butter Cups like crazy, so I knew something was up. I got my BFP (big fat positive) Sunday night, March 12 (4 weeks + 1 day) after I went grocery shopping with Dani. One of the items I picked up from the store was a box of pregnancy tests. As soon as we got home I took the test and confirmed what I already knew. I’m going to be honest – I feel like I got robbed of my special moment because of what ended up happening last time. It’s something I am still coming to terms with. That being said, I didn’t want to waste any time telling him once I found out. Joshua was hangry because Dani & I got home late from grocery shopping and was waiting for me to get home so we could eat dinner. After I put the groceries away I went and took a test. He had no idea what I was doing – he just thought I was taking my sweet time! I come out into the living room with the test behind my back. Both him and Dani are sitting on the couch waiting for me, and I say, “Guys, I’m pregnant!” We hugged and cried together hoping that this time it was the real deal. I had my first ultrasound the day before my father in-law’s birthday, so when we celebrated his birthday a week early, Joshua and I gave him a nice card simply saying his birthday present wouldn’t be ready until his actual birthday. We invited him and my stepmom-in-law over to our house where we presented him with a framed ultrasound. On Easter Sunday we shared the news with my parents, Joshua’s adopted parents and siblings. We started by FaceTiming with Joshua’s adopted parents individually since Dad was in Washington and Mom was on the East Coast. We told them the Easter Bunny left a present for them at our house and held up the ultrasound. Next we FaceTimed my sister-in-law and then our niece and her mom, both of which were super excited. We posted a selfie we took after our first ultrasound appointment on the family Facebook page. My parents were the last to know, but I made it really special for them. My grandpa passed away the day before, so it made sharing the news all-the-more special, especially since if it’s a boy I was already planning on naming him Paul after my grandpa. I created an Easter basket with giant plastic eggs and each egg had a photo of me as a kid/baby at Easter. There was one golden egg and that had the ultrasound, which they opened last. Needless to say all our parents are super stoked to be come grandparents! I told management privately a week before I told the team. The day I told the team I brought in donuts from my local donut shop along with a special sign. After I changed my status, I posted in our company Slack channel to let everyone know to check out the donuts and the special announcement. Not everyone came in at once to see the announcement, so it was neat to watch people come in throughout the morning and figure out what was going on. Everyone was super happy and excited for me! I started having morning sickness (more like afternoon and evening sickness) at the end of March and unfortunately it hasn’t subsided. In fact yesterday was one of my worst days as I couldn’t keep anything down all day (what way to celebrate the 2nd trimester). But if this means I’m continuing to develop a healthy baby then it’s so worth it! I’ve had major food aversions in addition to the morning sickness, so it’s been really hard to eat home cooked meals with the smells and all. One of the days I was home with bronchitis I made a batch of chicken noodle soup in the crockpot, but I could NOT eat it because of smelling it cook all day. It made me so sad! I’ve just had to take it one day at a time. Aside from my food battles, I’ve dealt with fatigue and I’ve definitely had my days at work where I could barely keep my eyes open. I’d come home and nap until Joshua would come home from work. April was a really rough month for me because I had bronchitis and a cold, both of which have resulted in a lingering cough that hasn’t quite gone away yet and has affected my sleeping. I feel like I am starting to get my energy back, and hopefully my morning sickness will subside soon so I can go back to exercising regularly again. I was really good about walking on the treadmill and doing yoga up until the morning sickness set in. Am also looking forward to not battling with food, either. Where’s the nursery going to go? In my old office room. Since Dani moved out at the beginning of April, I moved my office into what was formerly her room/the guest room, and now my old office will be the nursery. I had always planned on that room being a nursery ever since we bought our house. We probably won’t start decorating until we know the gender, but I have the layout figured out. Heck yeah! I have my official appointment set up for next month, but I can find out as early as 16 weeks by going to a 3D imaging center, which is something we plan on doing. We’re impatient! Plus I want to know how to decorate the nursery and buy all the things, hehe! Right now my registry is in progress over at Amazon.com. I’m still adding stuff to my registry as I wrap my head around the stuff I will need, so keep an eye out. Not quite sure when the baby shower will be, but we have some time to figure all that out. A VERY BIG congratulations!! This is wonderful news! !